The Groundsmaster® 4000/4010-D is the strongest most productive 11′ (3.4 m) mower available today. With the Kubota® turbo-charged, 58 hp (43.3 kw), diesel engine you can quickly mow through a variety of cutting conditions. The 4000/4010-D has the rare ability to mow a 0 degree uncut circle without the use of wheel brakes. The 4010-D includes the climate-controlled, all-season safety cab. Accessories for added value and versatility: cab with ROPS, rotary broom, 2-stage snow thrower, debris blower, 2-post ROPS, A/C mounting kit, speed control, and road package kit. The Groundsmaster® 4000-D/4010-D delivers 117 foot-pounds (158.6 N) of torque at 58 hp (43.3 kw) and 2,600 rpm. With so much power at your disposal, it’s easy to digest even a large amount of wet, thick grass. With its unmatched engine torque and patented hydraulic motors that directly drive spindles on each deck, the 4000-D/4010-D delivers power where you need it most to cut tough grass. Plus, the shallow deck design forces quicker clipping dispersal, allowing the decks to accept more grass on a faster basis. 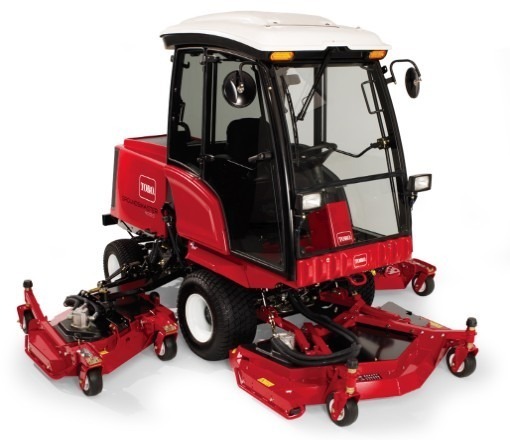 The Groundsmaster® 4000-D/4010-D mowers are easy to service and requires fewer parts to stock. That’s because the four drive belts, and the deck motors, blades, spindles, idlers, and spindle pulleys are all interchangeable. While rear discharge decks come standard, you can easily convert to Guardian® Recycler® decks which offer improved clipping management and additional safety. The impressive trimming capability means you can get around even the smallest object. The rare ability to mow a 0` uncut circle – without wheel brakes – allows you to easily mow striping patterns without leaving any grass uncut. Smooth turning is made possible by a tight 55.5` (141 cm) wheelbase and an inner, rear-steering turning angle of 53.5 degrees. There’s no need to worry about mowing around objects while traversing hills, even in wet terrain. The parallel hydraulic flow between front and rear wheels assures full-time 4-wheel drive. And the individual wheel brakes provide effective traction assistance on wet turf. In addition to effectively mowing a 62` to 11′ (157.5 cm to 3.4 m) swath with its fast wing lifts, the Groundsmaster® 4000-D/4010-D offers incredibly tight trimming capabilities. It allows you to trim how you want with one, two, or all three decks engaged, depending on the situation. The 4000-D/4010-D also features a unique, patent pending, parallel hydraulic traction system in forward and reverse that makes it much easier to trim around a tree or object without scuffing even while traversing a hill.